I know this isn't a very popular opinion, but I have to admit it - I love tofu. I'm not vegetarian, and I entertain very few dietary restrictions, but honestly, nine times out of ten I choose tofu for dinner over meat. It wasn't until I was gifted a copy of the Thug Kitchen cookbook that I truly fell in love - my first attempt at their baked tofu technique had me hooked. Gone was the bland and often rubbery food that had so often left me ambivalent; this tofu was crispy yet tender, and bursting with flavour. I soon began experimenting with my own marinades, and the recipe I'm sharing today is one of my all-time favourites; it's not my fastest recipe (the tofu needs time to soak in the marinade) but it is very low effort and easy to execute. There's also an element of practicality that comes into play - tofu is cheap, protein dense, and lasts longer in the fridge than meat; one of the reasons it's become a staple in my home. * I use Mirin rice wine, but any type of rice wine works. You could also substitute rice vinegar or even sherry vinegar here. ** I used white miso, but any type will work. *** You may be thinking, "what the hell is liquid smoke?" It's exactly what it sounds like, concentrated smoke in liquid form. Don't worry, you can skip this if you'd like/don't want to bother buying it. But it's quite cheap, one bottle will last forever, and it's pretty easy to find - check the section of your grocery store that sells barbecue sauces. Whole Foods will certainly carry it if you can't find it anywhere else. I think a bottle is somewhere around two dollars; especially if you're in to barbecue or smoky flavours, it's well worth the minor investment. 1. DRAIN your tofu. Cut open the package and pour out all the liquid. Next, wrap it in some paper towels. I usually wrap 2 paper towels around the tofu and tuck the ends underneath, then repeat this two more times, for a total of three layers of paper towels. It sounds like a lot, but tofu retains a lot of water and you're trying to squeeze as much liquid out as possible. The better you drain your tofu, the more marinade it will be able to reabsorb, resulting in maximum flavour. 2. PLACE your wrapped up tofu on a plate or cutting board (not a wood one), and place another plate/flat dish on top, so the wrapped tofu is sandwiched. Place something heavy, like a can of beans, on the top of your plate sandwich. The weight will push all the liquid in the tofu out in to the paper towels you've lovingly swaddled your tofu in. Leave the tofu to drain for about 30 mins-1 hour. 3. MIX the marinade while your tofu drains. You can absolutely do a straight mix, but I would recommend starting by throwing the miso and ginger together, and slowly whisking one of your liquids in (doesn't matter which) until the miso has broken up into a very loose paste. This will help create a more homogenous marinade, as opposed to one with big globs of miso paste floating around in the liquids. Once the loose paste is made, add in the other ingredients and give it all a good stir to incorporate everything. Pour half your marinade in to a small baking dish (I used my 7x9 pyrex baking dish, but a larger size like a 9x13 would also work; it just needs to be able to fit your tofu once cut). 4. 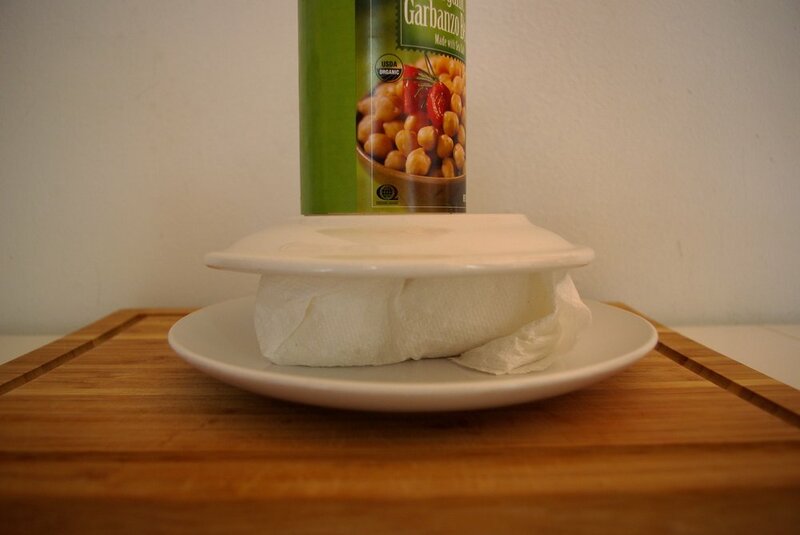 UNWRAP your drained tofu and discard the paper towels (once it's been at least 30 mins). 5. CUT the block of tofu into slices up to 1/4 inch thick; I usually cut length wise first, and then slice the planks in half width-wise. You can also just do slices up to 1/4 inch width-wise. 6. PLACE your sliced tofu in the baking pan with your marinade. Pour the remaining marinade over the top. Let your tofu sit in the marinade for at least two hours (but you could go up to eight hours if you want!) If your marinade doesn't totally cover your tofu, just flip them over every hour or so. 7. ONCE you're done marinating, preheat your oven to 450 degrees Fahrenheit (you might want to go with 425 if your oven is particularly powerful or has convection). 8. LINE a baking sheet with foil, parchment paper, or a silicon mat, and grease it with non-stick spray. Do not use an olive oil based spray - canola oil sprays or ones that specify for high temperatures are ideal. 9. 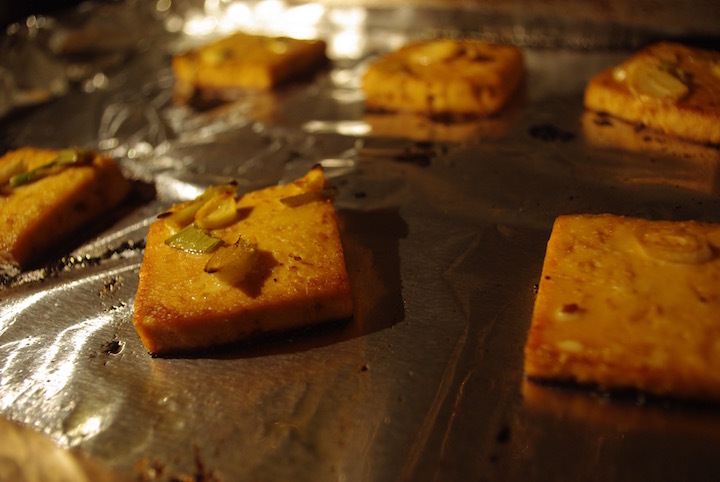 PLACE your tofu planks on the greased baking sheet, at least 1 inch apart. Give each piece of tofu a small spray of non-stick spray. Reserve your marinade. 10. BAKE the tofu for 15 minutes and remove from the oven. 11. 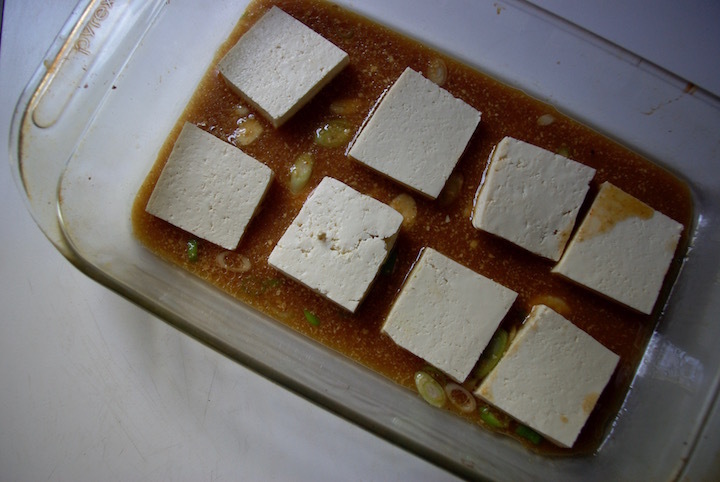 FLIP the slices of tofu over, and spoon some marinade over each individual slice. Return the tofu to the oven, bake for 10 mins more, and remove the tray from the oven. Don't worry if the tofu starts to look a little crispy/dark on the edges. 12. FLIP the tofu once more, and spoon some more marinade over each slice. If desired, you can sprinkle some sesame seeds over the top of each plank before returning to the oven. Bake for 5 minutes more. 13. REMOVE the tofu from the oven and let cool for a few minutes. If you have a ton of left over marinade, you could save it for another future marinade, use it as a salad dressing, or throw it in a pot to reduce a little and make a tasty sauce to serve along side your crispy tofu. 14. CUT the tofu into whatever size you desire, or leave it whole. For instance, you could cut the tofu in to small pieces and throw it in with fried rice, put it on top of a salad, or (what I usually do) enjoy along side some brown rice and steamed or roasted veggies with lots of scallions and sesame scattered on top (not because I'm healthy, just because I'm lazy). 15. ENJOY! Any tofu leftovers will last at least a week in the fridge.